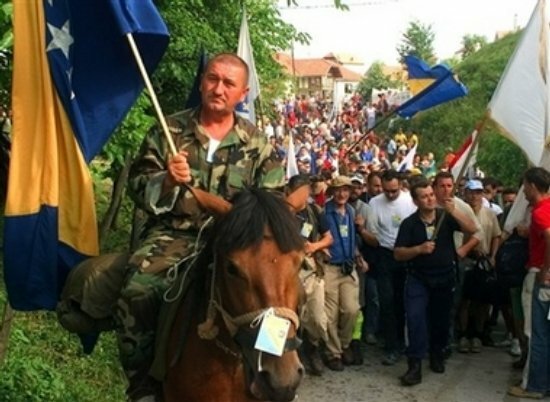 NEZUK, Bosnia-Herzegovina -- Marking the beginning of the commemoration more than 700 people started Friday a 100 kilometres-long march to pay respect to the victims and to honour survivors of the Srebrenica massacre. Hundreds of Bosnians began a four-day march Friday along the route survivors used 11 years ago to escape the Bosnian Serb killings in Srebrenica, the worst massacre in Europe since World War II and the first legally established case of genocide in Europe. 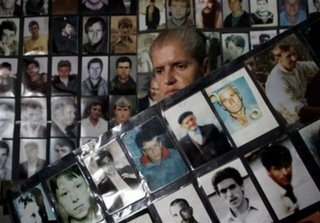 Over 8,000 Bosniak men and children (boys) were killed toward the end of the 1992-95 war when Bosnian Serbs troops overran the eastern enclave, which had been designated a U.N. safe haven. 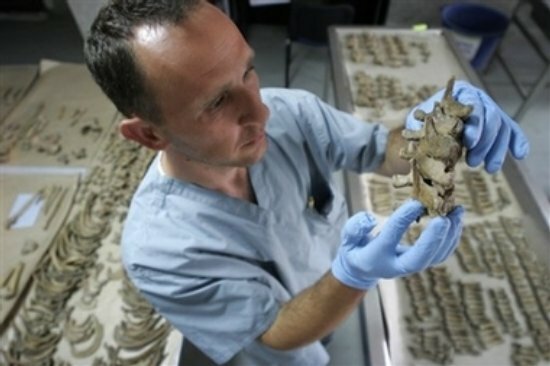 Their remains were buried in mass graves that continue to be found a decade later. 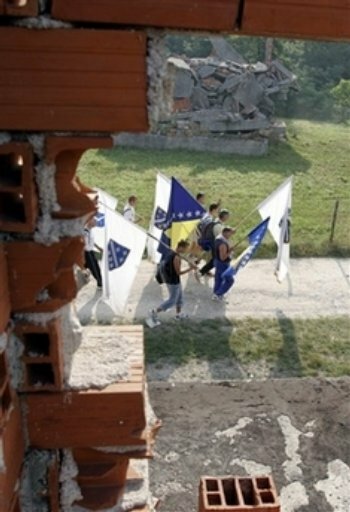 During the four-day march, which started at the village of Nezuk, the group are to pass the same route survivors used in 1995 to escape the slaughter in Srebrenica. The march is scheduled to end late Monday in Potocari on the eve of the commemoration of the 11th anniversary of the massacre. "It is very hard for me to participate in this march as it brings back the grim memories of what I had to do to survive. I lost my father and brother then and their bodies have never been found," said Taib Husejnovi a survivor from Srebrenica. Bosnian Serb troops stormed past 150 outnumbered and outgunned Dutch peacekeepers charged with protecting the U.N.-declared safe zone on July 11, 1995. About 15,000 people fled the town through the woods and headed west toward territory held by the Bosnian-government army in the village of Nezuk. They were pursued through the mountains by Bosnian Serb troops. Those who made it walked for seven days - dodging Bosnian Serb snipers and mortars and evading ambushes -surviving on berries and drinking water from trenches. A group of about 700 survivors and volunteers began a 100 kilometer march to retrace the route in reverse Friday, walking from Nezuk toward Srebrenica and aiming to arrive there July 11 for the anniversary. The group plans to stop and pray at mass graves, and U.S. Ambassador to Bosnia Douglas McElhaney is to address the marchers at Crni Vrh, the first and largest mass grave along the route, the AP reports. "We are here to pay respect to those who were killed in 1995 while they were under U.N. protection," said Ramo Dautbasic, the organizer of the memorial march and himself a survivor. "Our aim to draw attention to the fact that those people were systematically expelled and eradicated just because they were Bosniaks." Dautbasic was among those who managed to walk to freedom, but he lost his father and two brothers in the march. Their bodies have never been found. U.S. Ambasador to Bosnia, Douglas McElhaney, will address the group at Crni Vrh mass grave. During the ceremony to mark the anniversary, the remains of 500 people killed in Srebrenica will be buried at a memorial cemetery that already contains the remains of more than 1,800 others. Among those paying tribute to the victims was Venezuela's former ambassador to the UN, Diego Arria, who at the time witnessed the slow death of the eastern Bosnian enclave and tried to draw the world's attention to it. Their bodies were exhumed from more than 60 mass graves that have been found around the eastern Bosnian town. U.N. war crimes prosecutors have indicted Bosnian Serb wartime leader Radovan Karadzic and his top general, Ratko Mladic, for genocide and crimes against humanity for the atrocities at Srebrenica and elsewhere in Bosnia. Both remain at large. Organizers plan to carry out the march each year to mark the anniversary of the event. "I march and live in hope that one day the bodies of my father and brother will be found and buried at the memorial cemetery. I also live for the day when all responsible for this massacre will be captured and punished," Husejnovic said. Despite years of searching Karadzic's whereabouts remain unknown, while Mladic is believed to be hiding in Serbia.